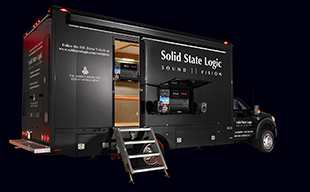 Solid State Logic, the worlds leading manufacturer of advanced tools for audio professionals, is proud to announce the introduction of the MADI Dante Bridge, the worlds first broadcast specification bridge between the industry standard MADI audio format and Dante IP Audio Networks at IBC 2013 (Hall 8, Stand B.83). The MADI Dante Bridge enables SSL C100 HDS and C10 HD Digital Broadcast Consoles or any other standard MADI device to connect to Dante networks with full redundancy maintained. The release of SSLs first Dante I/O product adds the substantial weight of the SSL brand to the adoption of Dante and AVB standards as the industry choice for IP Audio networks. The MADI Dante Bridge is a broadcast specification MADI-Dante interface, allowing expandable audio routing between SSL consoles or any MADI device and Dante IP Audio networks. With 64 channels per Bridge (@ 48kHz) and up to 512 channels per 1GB network link, Dante is fully scalable and capable of providing routing channel counts from tens to thousands and beyond using standard IT infrastructure. Redundant PSU, MADI ports and Dante ports mean the Bridge is built for uninterrupted operation, keeping critical devices and audio paths functioning throughout the broadcast facility. In addition to the inbuilt clock redundancy options in Dante controller, the MADI Dante Bridge also includes a pair of redundant sync inputs for use as a self-redundant Dante Grand master clock. Intended for use with Dante controller and third party Dante products, the MADI Dante Bridge shows commitment to interoperability while understanding Broadcasters critical needs. The Bridge features a front panel headphone socket (with rotary level control) and inbuilt headphone monitor routing, to truly replace traditional patch bay confidence routing and fault finding functionality with equivalents in the IP Audio domain. Simple font panel controls facilitate routing mono or stereo paths from MADI In, MADI Out, Dante In or Dante Out directly to the headphones. A front panel LCD screen provides signal present metering selectable to show four points in the signal chain: MADI In, MADI Out, Dante In and Dante Out. GPIO connections allow for transfer of tally info and switching functions across the network with the Audio.